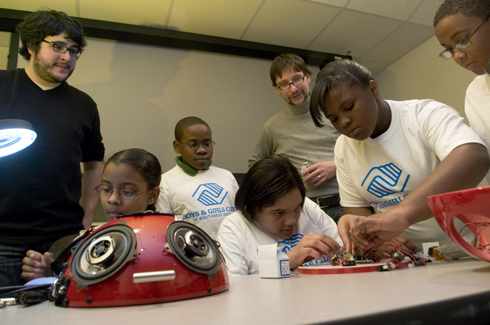 The group works with children from the Boys & Girls club. BLACKSBURG, Va., April 16, 2010 – Virginia Tech's Linux Laptop Orchestra, L2ork, will hold its spring concert on Saturday, April 17, to showcase a challenging program as well as its recent educational and outreach endeavors with fifth graders from Roanoke. Since Virginia Tech's laptop group is the first Linux-based orchestra in the world with a focus on affordable design, it can be more easily imitated in K-12 education, serving as a bridge between STEM (science, technology, engineering, and mathematics) education and the arts. This semester, several Virginia Tech students helped out at the Roanoke Academy for Math and Science where members of the Boys & Girls Club of Southwest Virginia began their journey as laptop orchestra musicians. In Squires Student Center on Saturday, the Boys & Girls Club will give a demonstration of their skills at 7 p.m. followed by a benefit concert by L2ork at 8 p.m., where all donations will benefit the Boys & Girls Club. L2Ork's spring performance features original works written or arranged specifically for the 14-member ensemble by Director Ico Bukvic, assistant professor of music. Virginia Tech's soprano Chelsea Crane, a graduate student in music education from Stafford, Va., will add vocals with appearances from faculty guest artists Ron Coulter from the Southern Illinois University at Carbondale and Mark Engebretson from the University of North Carolina at Greensboro. In addition, Matthew Burtner, an associate professor of music from the University of Virginia, will share a piece for Metasax and musical robots. After kicking off ArtsFusion week in Blacksburg, L2ork will hit the road on its first concert tour, playing at the Cincinnati's Conservatory of Music on April 20 as part of the Sonic Exploration concert series. The Virginia Tech group will then travel to Southern Illinois University on April 22, and Indiana University Purdue University Indianapolis on April 25 as part of the International Intermedia Festival of Telematic Arts. L2ork's maiden tour was made possible through generous contributions from Virginia Tech's Center for Creative Technologies in the Arts, Institute for Society, Culture and Environment, Bradley Department of Electrical and Computer Engineering Department, Collaborative for Creative Technologies in the Arts and Design, and Center for Human-Computer Interaction. Read related University Spotlight on Achievement for more information and videos about L2ork: "Laptop orchestra combines music with technology, gaming skills"